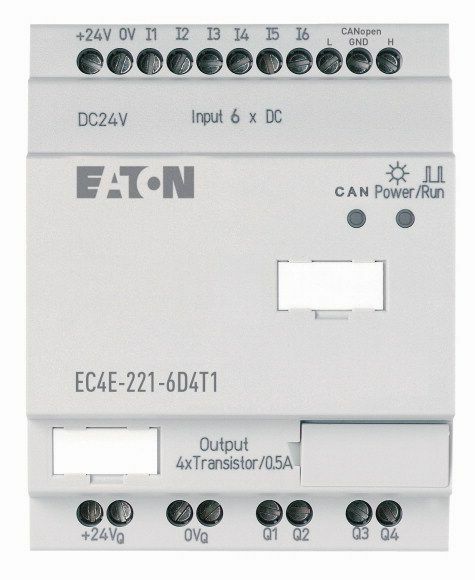 The EC4P compact PLC rounds off the existing easy range closing the gap between the easyControl relay and the PLC. 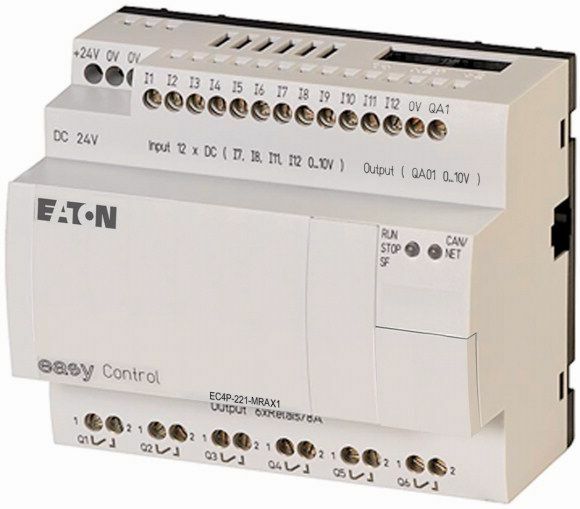 easyControl features a 256 kByte program memory, an instruction processing speed of 0.3 µs per instruction and optional Ethernet on board. The extended communication options, such as CANopen and Ethernet, open a wide range of applications. 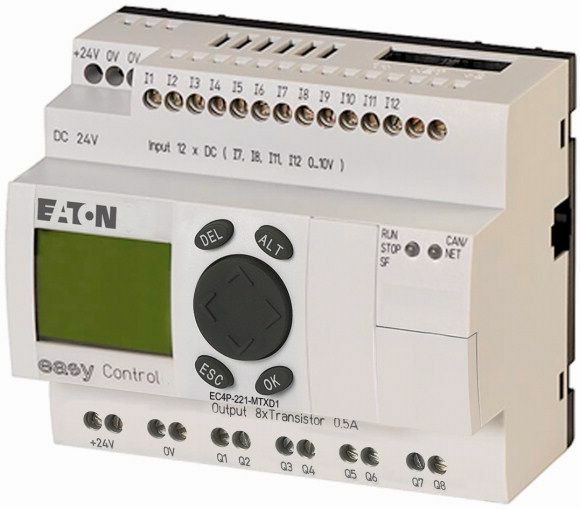 The compact control is available in 16 variants and features relays or transistors. It is available with or without a display, Ethernet or analogue output. - The integrated communication interface can be used for CANopen or easyNet. - The integrated Ethernet interface enables the easyControl to be programmed conveniently and also installed in existing infrastructures such as OPC. - The slot for a memory module ensures easy program or firmware updates. The memory module is also fully suitable for programming or archiving data. The central or distributed expansions is implemented on easyControl with the standard expansion modules from the easy product range. Together with the expansion units EASY618-AC-RE, EASY618-DC-RE or EASY620-DC-TE you can configure a unit with 24 inputs and up to 16 outputs. The expansions are situated directly on the base unit and are connected using the easy-Link interface. The easy coupling module EASY200-EASY enables decentralised expansion of up to 30 meters via a twisted pair cable. With easyControl you have versatile communication features directly on board with Ethernet, CANopen, easyNET and easy-COM. easyControl can be connected to PROFIBUS DP, CANopen, DeviceNet or AS-Interface via communication modules. easyControl can be simply connected to all easy expansions and simply networked at an attractive price via easyNET. Up to 8 nodes, easy800, easyMFD or easyControl can communicate with one another at a distance of up to 1,000 meters. It is irrelevant whether the respective device is running its own program or whether a distributed input/output module is used. Universal utilisation in automation applications is possible with up to 320 I/O points. 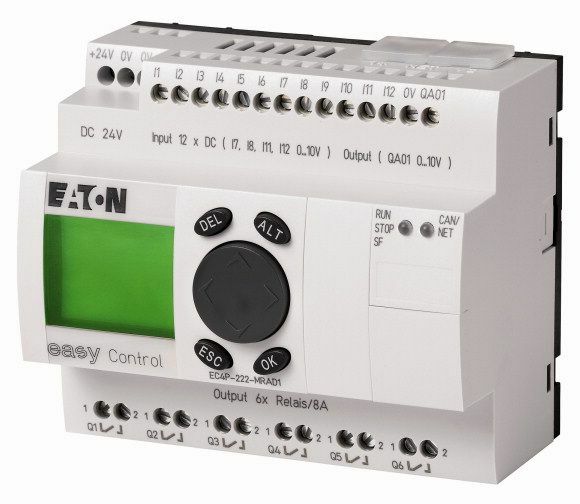 easyControl can be operated as a CANopen master or slave via the integrated CANopen interface. Accordingly, easyControl can be connected trouble-free to all PLCs, control panels, drive controllers and field devices featuring CANopen interfaces. easyControl features Ethernet on board, depending on the device type. It is thus ideally equipped for demands such as OPC servers, simple programming and integration in existing infrastructures. Connection to the fieldbus is particularly easy using the communication modules of the easy range. It can be coupled to all expandable easy base units of the easy600/700/800, MFD-Titan and easyControl series via easy-Link. The following fieldbus connections are available for easyControl: PROFIBUS DP, CANopen, DeviceNet and AS-Interface. The bluetooth adapter EASY800-BLT-ADP allows simple communication to easyControl from outside loud and/or dangerous areas. The adapter makes it possible to conveniently commission and service machines and other equipment remotely. An 8-digit PIN security code prevents unauthorised remote access to the PLC.